A "substantial number" of women would lose free birth control coverage under new rules by the Trump administration that allow more employers to opt out of providing the benefit, a U.S. judge said at a hearing Friday. The judge previously blocked an interim version of those rules — a decision that was upheld in December by an appeals court. 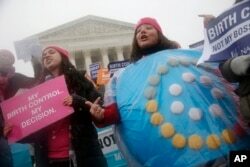 FILE - Margot Riphagen of New Orleans, La., wears a birth control pills costume during a protest in front of the U.S. Supreme Court in Washington, March 25, 2015. Karli Eisenberg, an attorney for California, told Gilliam on Friday the loss of free contraceptive coverage from employers would force women to turn to government programs that provide birth control, and if they are ineligible for those, increase the risk of unintended pregnancies.